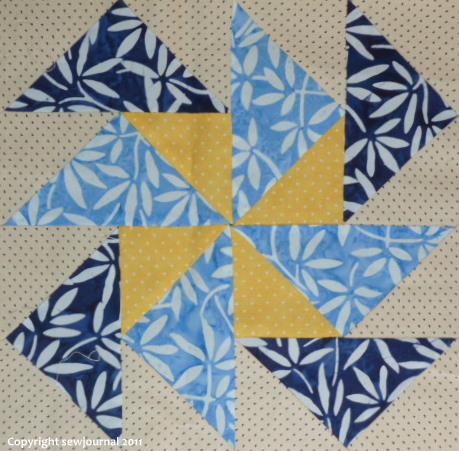 The Flying Geese block is one of my favourite blocks. I like it in all its forms, from Dutchman’s Puzzle to Strings of Geese. Recently I came across away of making them doesn’t waste any fabric. It uses one large square and four small squares of fabric. I thought I’d share the links with you. The first link is to a pdf that gives instructions on how to execute the “no-waste” method. I found the pdf a little hard to follow at first. However, I then found this second link which goes to a webpage that demonstrates the technique with photos. I’ve included both links because the pdf can be printed out, and once you have read the demonstration page the pdf becomes very clear. It’s nice to have a printed copy to file away for when you need it. I also found a third link to a Google doc that shows the whole technique and calculates the square sizes needed for a variety of Geese sizes. I hope you find these helpful. Thank you so much for all this information! You never cease to amaze me! Yes I did see that but it seemed to make for quite a bulky block and waste a lot of fabric. This is my favourite method of doing flying geese. I really don’t like waste. The Ricky Tims one is for a 3D block and I like it too.